feels like it’s been a while since i’ve done one of these posts. with Spy out of town most every Sunday in October, i think most Sunday suppers for a while there consisted of cheese, crackers and wine. not much worth reporting there. it’s gotten so damn cold here all of a sudden that all i want to do is light a fire, put on my slippers and get some soup simmering on the stove. so that’s exactly what i did this evening. totally thrown together in my non-recipe, crap, what’s in the fridge? kind of way, but this came out as absolutely what i wanted — even though the vision started with white beans. i only had one can, so i switched to black. 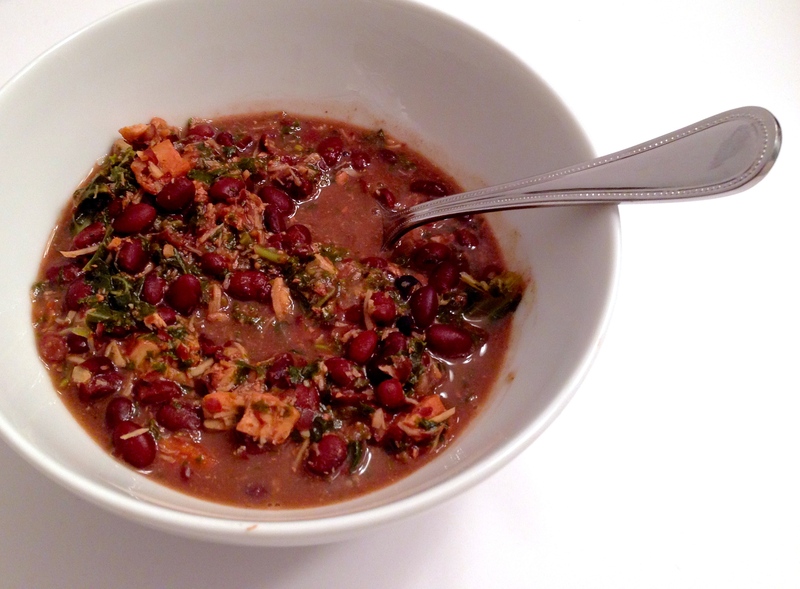 looks a bit like chili here, but it’s actually just a savory, non-spicy comfort-foody bowl of goodness for your tummy. add crusty bread and i might be able to live all winter on this stuff. enjoy! in your soup pot, sautée the onion, garlic and chicken in olive oil with some salt and pepper. add about half the Herbes de Provence. when chicken is cooked through, add the kale on top and cover pot for about 5 minutes to let the kale steam down. add beans, chicken broth and rest of Herbes. let it come to a boil, then simmer for about 45 minutes (or more) until everything is nice and soft. cheat: i use a hand blender to purée just a little of the mixture so it has a slightly thicker consistency.